Apply at: https://jobs.usc.edu/postings/71574 – and contact me! 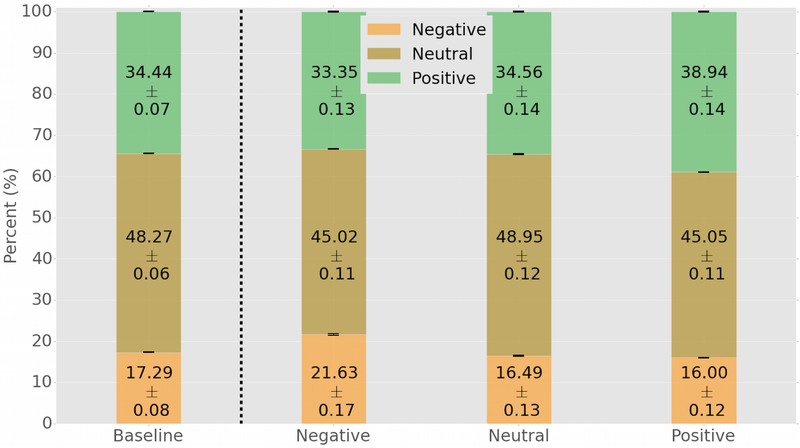 Our recent work on measuring the presence of emotional contagion in Twitter is finally published on Plos One! The paper, in collaboration with Zeyao (Patrick) Yang who recently graduated from Indiana University, is attracting a lot of media attention! The theory of emotional contagion hypothesizes that emotions and emotional states are transferred from one person to another by social interactions. Traditional social science studies that date more than half a century ago’ (Fromm, The Art of Loving, 1956) aimed at proving that in-person exchanges cause the unconscious emotional alignment of the interacting parties. One hypothesis was that non-verbal cues (body language, facial expressions, tone of the voice, etc.) are crucial ingredients for emotional contagion. Fast forward 60+ years, nowadays we are trying to validate the theory of emotional contagion via social media interactions! This setting is much weaker than the traditional one: first, our goal is to assess whether only textual cues are sufficient to trigger emotional contagion, through interactions where non-verbal stimuli are absent; then, we try to isolate this phenomenon in a social platform (Twitter) where links among users carry a weak meaning (users follow others mostly based on shared interests, rather than on pre-existing links in the offline world, like on Facebook). Indeed, it’s quite intuitive to expect that, if a Facebook friend informs us of a good (or bad) news, we will be happy (or sad) for her/him. However, what about complete strangers? Is language alone powerful enough to change our emotional states when exposed to emotional contents? Our study describes phenomena compatible with emotional contagion, and proposes clever statistical techniques aimed at discounting biases common in observational social network studies. Positive emotions are stronger than negative ones, in that they successfully affect up to four times more frequently users exposed to them than negative emotions. Furthermore, not all users are equally susceptible to emotional contagion: similarly to what happens with people’ susceptibility to catching the flu, or that of computers to catch a virus, some individuals are more inclined to change emotional states as a reaction to the contents (and the emotions) they are exposed to, while others hold stronger emotional states that rarely change, irrespectively of the type of emotional stimuli they receive.